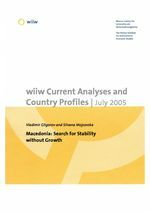 Macedonia has enjoyed price stability, but not growth during transition. As a consequence, it has a very high unemployment rate. Thus, prudent demand management has not led to a positive supply response. The macroeconomic policy mix chosen in 1994 and followed since then was adequate for stability but not for growth. Macedonia opted for a very strict fixed peg to the German mark and then to the euro. It devalued its currency, the denar, only once, in 1997. It supported the exchange rate with a restrictive monetary policy that kept interest rates high. Both proved to put up obstacles to internal and external liberalization. In addition, a policy of fiscal restraint was pursued, except for occasional surges in discretionary spending that required fiscal adjustments later on. Thus, the macroeconomic policy was not suited to a country that faced significant shocks because it effectively left Macedonia without any shock absorbers. The alternative economic policy starts from the following observations: public expenditures are quite low by comparative standards, public and foreign debts are moderate, and both the monetary and fiscal policies are restrictive though actual growth is well beyond potential growth. Also, the reforms ahead will lead to increased competition and liberalization. Those observations suggest the following set of policy changes: Monetary policy should become more active. The way to do that is to move away from using the fixed peg as an anchor and with a view to adopting inflation targeting. The aim would be to retain price stability at a lower level of interest rates. Public expenditures should be increased to achieve development goals. Macedonia needs investments in infrastructure and in communal services. As a transit and a potential tourist country, these investments seem reasonable. In addition, investments in human capital, particularly in education at all levels, should be increased. Primary education is still a problem in some regions and that should be a priority. Institutional reforms should be pursued aggressively and rapidly. That will also shorten the time required for EU integration. The priorities are well known especially when it comes to the strengthening of the rule of law. The report has two parts. In the first, a comparative approach is employed in order to draw some conclusions from the experience of transitions in general. In the second part, a more detailed description of Macedonia¿s economic development together with a discussion of various policies is to be found.